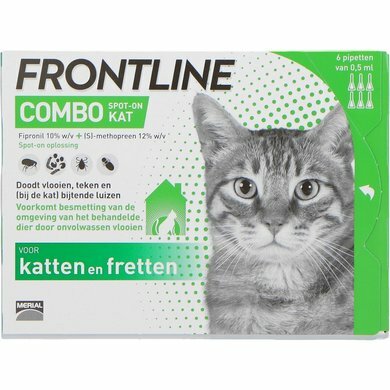 Frontline Combo Spot-on for the cat fights fleas, ticks and biting lice in cats older than 8 weeks or heavier than 1 kg. Can also be used for ferrets older than 6 months. This package contains 6 pipettes. Flea duration: 4-6 weeks for cats. Duration of action ticks: 2 weeks for cats. 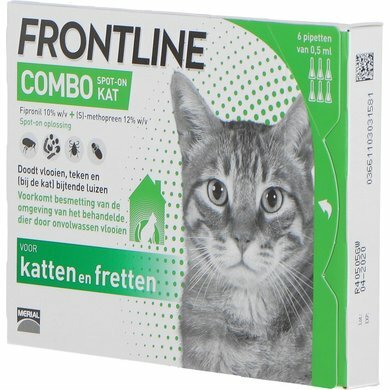 Frontline Combo is a unique approach to combat fleas, ticks and biting lice on your cat. It also prevents contamination of the treated animal's environment through immature fleas. Two birds with one stone! The interval between 2 treatments must be at least 4 weeks. 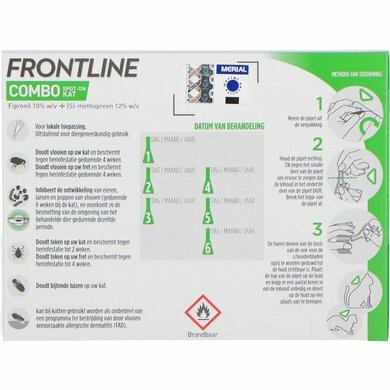 Like the trusted Frontline®, Frontline Combo is applied to your animal with a pipette treatment and kills all adult fleas and offspring within 24 hours by stopping the development of eggs, larvae and pups. Ticks and lice are killed within 48 hours. In the absence of available data, do not administer the product to kittens younger than 8 weeks of age and / or to kittens weighing less than 1 kg. Do not use on sick (eg systemic diseases, fever) or convalescent animals. Do not use in rabbits, as side effects and even death can occur. Among the very rare suspected adverse reactions, transient skin reactions at the application site (flaking, local hair loss, itching, redness) and general itching or hair loss were reported after use. Excessive salivation, reversible neurological symptoms (hypersensitivity, depression, other nervous symptoms) or vomiting were noted after use. If the product is licked, a short period of excessive saliva can be noticed, mainly due to the solvent. Use during pregnancy or lactation: The drug may be administered during pregnancy and lactation. - 1 pipette of 0.5 ml for a cat. - 1 pipette of 0.5 ml for a ferret. The Spot-on liquid in the pipette must be completely emptied onto the skin between the shoulder blades. The liquid should gently penetrate the skin and not massage. My cat does not really like applying drops with a pipette. It remains a hassle! Still one of the best working products against ticks and fleas. Easy one product for both. 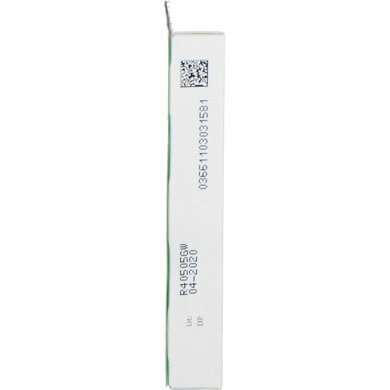 Since we use these pipettes, our cats no longer have fleas, but we usually give them monthly throughout the year. 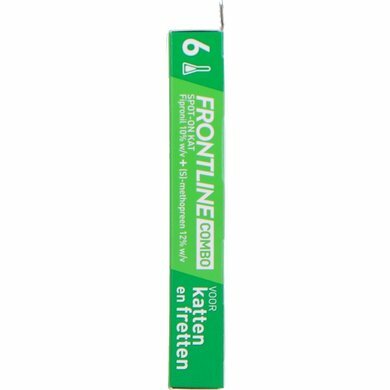 Question: I have 2 cats of 6 and 5 kg., the pipettes frontline combo spot-on cat are strong enough to prevent fleas and so on. 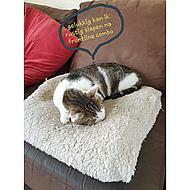 Answer: Frontline Combo Spot-on Cat> 1kg 6 Pipettes are suitable for cats from 1 kg or heavier. There is no maximum weight coupled as some other brands do (for small or large cat).